The Hotel Villa Ombrosa , 3-star hotel in Milano Marittima, is surrounded by a lush garden and has private parking, free bicycles, mini club and restaurant with local cuisine and 3-choice menu. No pets allowed. 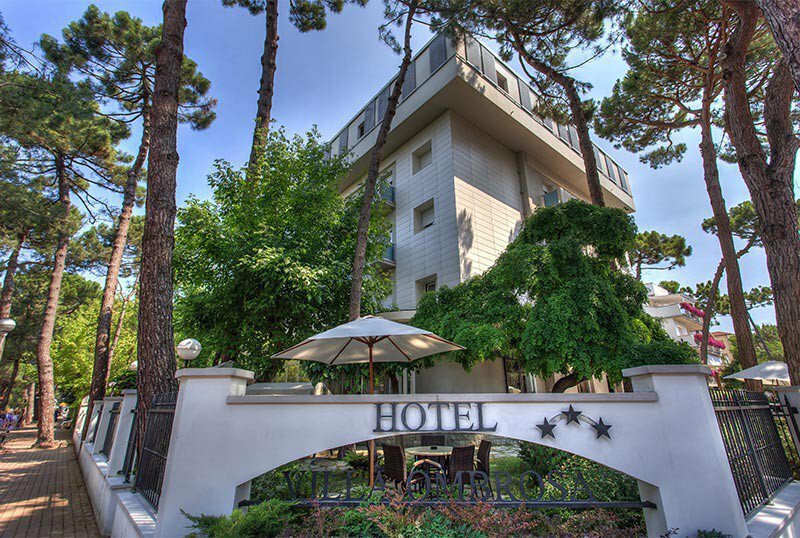 The hotel is located in Milano Marittima less than 5 minutes walk from the beach, in a quiet area near the pine grove. Recently renovated, the rooms are equipped with balcony, air conditioning, direct dial telephone, safe, free WI-FI, TV (Mediaset Premium) and private bathroom with shower and hairdryer. Large garden, open-air porch, free bicycles, hall, bar, lift, beach towel available. PARKING: uncovered and free, available as long as seats are available. AIR CONDITIONING: present in all environments. LUNCH AND DINNER: local cuisine with 3-choice menu, fish always present, vegetable and appetizer buffet, homemade meals and desserts. In the hotel: baby / mini club, entertainment. The hotel has an agreement with the Bagno Touring and the Bagno Marilena, establishments equipped with services and spaces dedicated to adults and children. The Bagno Marilena, specifically, has a bar and restaurant. Price list is per person per day for one min. Of 3 days. - Unwanted meals are not refundable. free child in the room with two adults, minimum stay 7 days. Super Bimbo Gratis offer in June at Milano Marittima! from 01 to 09 June, minimum stay of 7 nights, in Formula All Inclusive, starting from € 59.00 per person per day. Child up to 10 years FREE in room with two adults, the second discount of 50%. Tourist tax of € 1.50 per day per person excluding children under 14, for the first seven days to be paid in cash is not included. Full board, water and wine with meals, beach service, daytime and evening entertainment, baby-club in hotel during meals. - Seven days in a double room: € 490.00 per person, free child up to 10 years. - Animation adults and children on the beach, baby-club in the hotel during meals.